Register your home or business video surveillance system under "Forms / Links"
Vacation House Watch and Patrol Request Forms are now available online! You can find these forms under "Forms / Links" tab. Printable versions are available too. Find out how to get your free gun lock at MPD. Pharmaceutical disposal bins available at the Police Station. For your convenience, a "Personnel Complaint Form" can now be printed from this site under the Forms/Links. The Moraga Town Council recently approved the revised Emergency Operations Plan for the Town. Although no document can list or account for all of the possibilities in a disaster or critical incident, this plan is intended to be the guiding document for the Town during one of these times. You can review it by clicking here. The Town of Moraga has been divided into 23 separate evacuation zones. This allows emergency responders to notify a specific geographical area of the need to evacuate, using the Contra Costa County Community Warning System. There is a description of each zone, including potential routes and meeting points (collection areas). However, in a true emergency, these may be changed due to the type and location of the emergency to avoid sending residents into harm's way. Click here to review the zone map. Click here for important information about how to prepare for a possible evacuation. 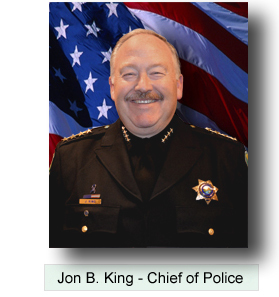 Welcome to the website of the Moraga Police Department. The members of the Moraga Police Department are dedicated to providing excellent service to the residents of and the visitors to Moraga, helping to instill a sense of comfort and security. Although Moraga is often thought of as a sleepy burg, it is a vibrant community filled with volunteerism, community activities and citizens dedicated to creating and maintaining an excellent quality of life for their families. We are blessed to be the home of St. Mary’s College and include their many students and staff as part of our community. The Moraga Police Department is proud to be a part of and serve the entire Town. I am proud to be your Chief of Police, having been appointed by our new Town Manager, who served as one of the original members of the Police Department and as our previous Chief. It is an honor to be selected to lead the long standing tradition of community service and problem oriented policing that have long been the hallmark of the Moraga Police Department. I appreciate the support of the many community members who have taken the time to reach out or simply stopped to introduce themselves and welcome me. We will continue to engage with our community to learn firsthand of their needs and priorities. Please join us as we participate in community events and host our Coffee with a Cop gatherings. We have recently begun having lunch on campus with elementary and middle school students to get to know them better. Please subscribe to our Nixle.com feed, through which we provide important information about crime alerts, traffic problems and community activities. Our website provides you with information about many of the services that we provide, including vacation house checks, security surveys of your residence, fingerprinting and a disposal location for old, unnecessary pharmaceuticals. Please take a few moments and explore. Of course, we are always interested in your suggestions for improvements. The Moraga Police Department will continue to work to earn and maintain your trust as we work together with you to protect and serve our community. On behalf of our entire police department, if you are a visitor to our town – Welcome to Moraga! If you are a Moraga resident, thank you for your support! emergency information, press releases, and community event information quickly and easily. All Lamorinda area residents are encouraged to subscribe for this service, which is free other than data plan fees for mobile phones. The messages from the Town can be sent via text message, email, and over the web. To subscribe, click on the link on the Town’s website. It takes minutes to subscribe, so please register for this public notification service. Firearms Safety is critically important in Moraga and every other community. Both State Law and Town Ordinance require you to store your firearms, ensuring they are not accessible by children. Firearm owners can be held criminally liable and go to jail if their guns are unlawfully used or discharged by children. The Moraga Police Department offers free gun locks to anyone who wants one. Gun locks are available at the Police Department front counter (M-F, 9am-5pm) or from any Moraga Police officer. We provide a gun lock, distributed by Project ChildSafe, that is a cable-style gun lock that requires that most firearms are unloaded when they are locked, providing another layer of safety. Other types of gun locks for specific firearms can be located here. Additionally, gun safes and other locking containers that are secured to a floor or wall are effective tools in preventing firearms from being stolen in a burglary. The Moraga Police Department will also dispose of any unwanted firearms, free of charge. Bring your unwanted firearm, of any type, to the Police Department. Leave the firearm secured in your vehicle when you arrive and an officer will meet with you, retrieve the firearm and accept it for desctruction. All of these firearms are destroyed at no cost to you. Please help keep our community safe by ensuring your firearms are secured at all times. The Moraga Police can provide you with educational information for use in teaching children about firearms safety and to not touch unattended firearms. Call Moraga Police at (925) 888-7055 for more information. In association with both the Central Contra Costa Sanitary District and the Central Contra Costa Solid Waste Authority, and with the approval of the US Department of Justice Drug Enforcement Administration, the Moraga Police Department offers a receptacle for expired or unwanted prescription drugs. The disposal bin is located in the lobby of the Police Department and can be utilized Monday through Friday between the hours of 9:00 AM – 4:45 PM. To utilize this service, please take pills out of their containers and put them in a ziplock bag which is provided, then deposit the bag into the bin. All other items stay in their respective containers and put in ziplock bags. Creams go in separate ziplock bags away from liquids. The goal of this service is to keep medications from entering our water system, which benefits everyone. Just a reminder, MPD do not take sharps. Sharps can only be dropped off at Moraga/Orinda Fire Station 41 on Moraga Way. from ALPRs. You can review the policy here.